Worldwide by easyJet now connects to a total of 11 airports across Europe, including Amsterdam, Barcelona, Paris CDG and Orly, which in addition to London Gatwick, Milan Malpensa, Berlin Tegel and Venice Marco Polo, means that over half of the airline’s flights – and 53 million easyJet customers a year – will be able to connect to airline partner services and other easyJet flights in a single booking through easyJet’s digital booking portal. easyJet is well prepared for Brexit. It now has 130 aircraft registered in Austria and has made good progress in ensuring it has a spare parts pool in the EU27 and in transferring crew licences, both of which will be completed by 29 March. Both the EU and the UK have committed to ensure that flights between the UK and EU will continue in the event of a no-deal Brexit. In order to remain owned and controlled by EEA qualifying nationals, as required by EU regulations, easyJet has a number of options, including the use of the provisions contained in its Articles of Association which would permit it to suspend rights to attend and vote at meetings of shareholders and/or forcing the sale of shares owned by non-qualifying nationals as well as other potential actions. easyJet has increased its ownership by qualifying EEA (excluding UK) nationals to around 49%. Full Year unit fuel bill is likely to be £10 million to £60 million adverse4. The total fuel bill is expected to be c.£1.46 billion, reflecting a reduction in the price of oil since November and continued higher carbon pricing. Top Copyright Photo (all others by the airline): easyJet (Europe) Airbus A320-214 WL OE-ICR (msn 6885) ZRH (Rolf Wallner). Image: 944772. 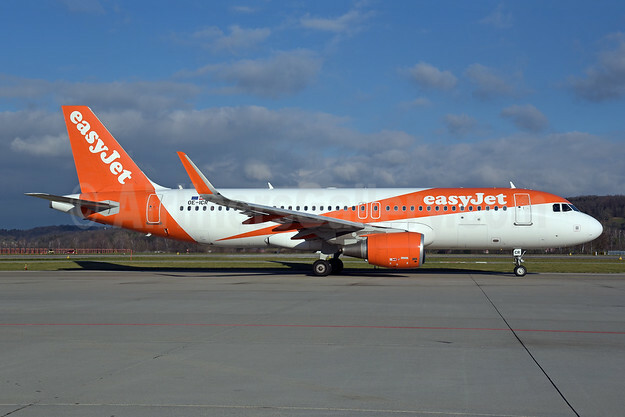 This entry was posted in easyJet (Europe), easyJet (UK) and tagged Airbus A320-214 WL, easyJet (Europe), easyJet (UK), msn 6885, OE-ICR on January 22, 2019 by Bruce Drum. 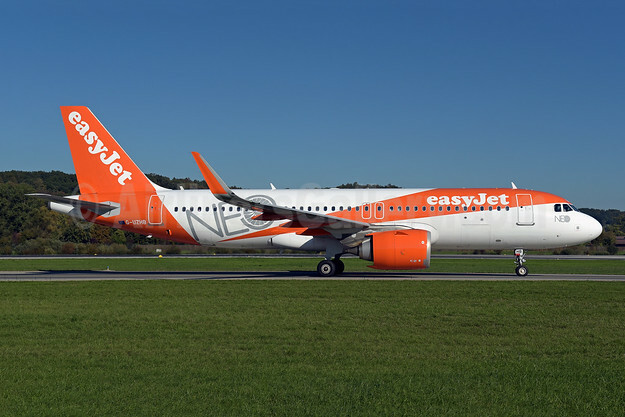 Airbus has reached an agreement with easyJet that extends the airline’s fleet plans into 2023, exercising purchase rights to firm orders for 17 A320neo aircraft. Top Copyright Photo (all others by easyJet): easyJet (UK) Airbus A320-251N WL G-UZHB (msn 7705) (NEO) ZRH (Rolf Wallner). Image: 943811. This entry was posted in easyJet (UK) and tagged Airbus A320-251N WL, easyJet, easyJet (UK), G-UZHB, msn 7705 on November 21, 2018 by Bruce Drum. easyJet has announced that it has reached a key milestone in its ambition to attract 20% of new pilots joining the airline to be women by 2020, having achieved a new high of 15% of new entrants to the airline being female, over the past financial year. It comes at a time when only 5% of all pilots worldwide are female, according to the International Society of Women Airline Pilots. Of that, just over 450 of them have achieved the rank of captain – which means that almost every female commercial airline captain could fit onto an A380 aircraft. When we launched the initiative to attract more women into a career as a pilot in October 2015, women only made up 6% of easyJet’s new pilot intake. As a result of the campaign in 2016, easyJet had doubled the intake to 12% and has been increasing ever since towards its ambitious target of 20% by 2020. When we set out the goal we expected that 20% would equate to 50 female pilots, owing to our growth, we have attracted more than 50 female pilots this year and now have more than 200 female pilots flying for easyJet. “As well as encouraging applications from women now, we also recognise we need to start young so that we can be simultaneously changing perceptions of the career and so improving the gender balance of the profession for years to come. That is why our pilots have completed more than 100 school visits last year and we signed up to sponsor the Girlguiding Aviation badge for Brownies to get girls interested in flight at an early age. In FY19 easyJet will recruit 460 new pilots to meet record demands for the airline for a third consecutive year, as its European network continues to grow. Opportunities range from cadet pilots starting their career to experienced co-pilots and captains from other airlines and the military. This entry was posted in easyJet (UK) and tagged easyJet on November 16, 2018 by Bruce Drum.